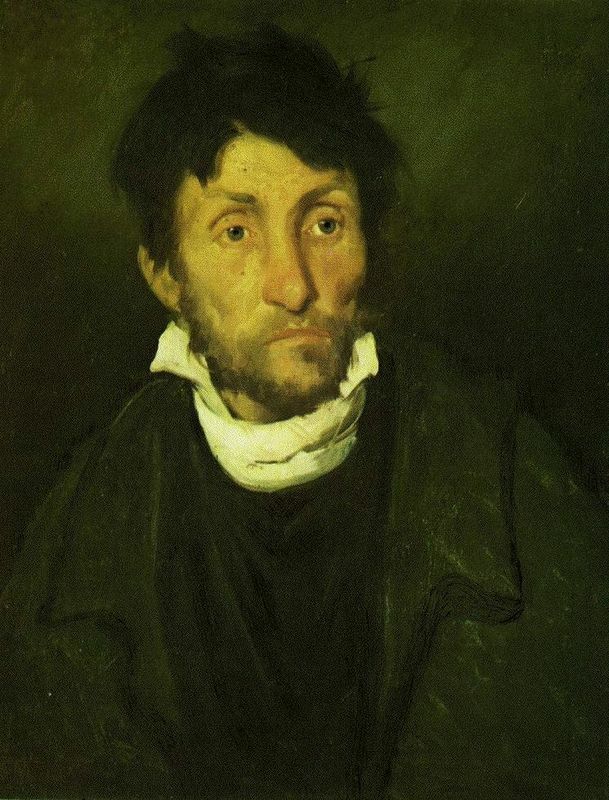 Frail, brooding and sensitive, Géricault was as romantic as a Romantic painter could be. 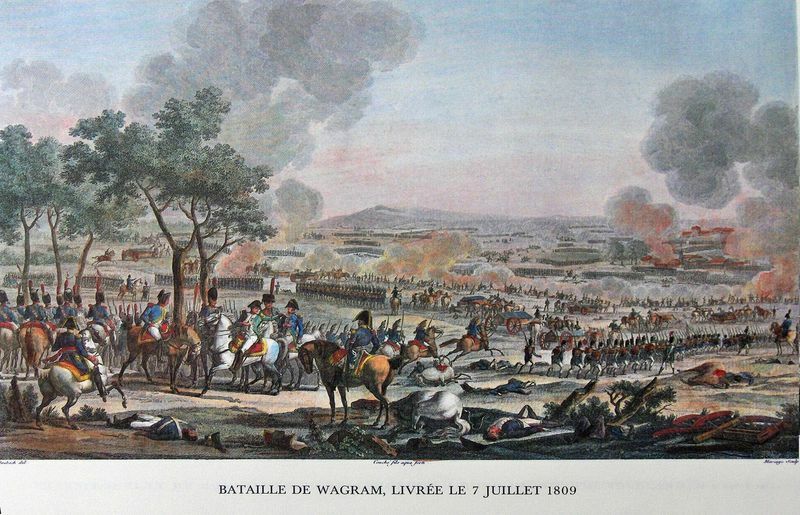 While he began his career with grand military statements for the Emperor Napoleon, it was his later works, with their emotional brutality and raw empathy that captured the hearts of audiences for generations. His masterpiece, The Raft of the Medusa was iconic in the era in which he lived, forging a new emphasis on raw emotion and sharply veering away from the refined compositional studies of Neoclassicism. Unfortunately, Gericault's death at an early age prevents us from knowing how much further into the depths of humanity Géricault was capable of plunging. However, the work he did leave however was of great importance to the Romantic Movement. Romanticism is sometimes viewed as a reaction to its more serious predecessor, the Neoclassical movement. As Neoclassical artists focused on properly accounting history through close attention to detail, Romantic artists flirted with themes of man's self glorification, man's part in nature, divinity found in nature, and emotion. They were part of a complex multimedia philosophical movement, involving the literary, visual, and intellectual arts. Born in the pleasant middle-class enclave of Rouen, France, to affluent parents, Géricault's artistic inclinations were fed from a very young age. In 1808 he began his first apprenticeship with Carle Vernet, a Neoclassical painter who shared young Théodore's fascination with horses. Géricault was interested in a style of painting that was less rigid and contrived than the Neoclassical works he was taught to emulate, and to this end he utilized a new set of preparatory practices. Gericault then turned worked in another studio, that of Pierre-Narcisse Guérin, where he met another young fiery Frenchman, Eugéne Delacroix. The two would forge a lasting friendship and mutual admiration, going on to found the artistic movement known as Romanticism. After a stint fighting for Napoleon as a French Musketeer, Géricault became involved in politics which led to the creation of what is considered his Romantic masterpiece, The Raft of the Medusa, in 1818. This painting depicts a tragic event in French History - the shipwreck of the French vessel "Medusa" in 1816 and with this piece the artist polarized the critics and established himself as a young face to watch. On the strength of this painting and his other lithographs, Géricault toured around England from 1820-1822, gaining widespread fame and fortune. Upon his return to France, the artist executed a well-received series of ten paintings depicting various types of insanity. He travelled to the Paris asylum of Salpetriere, and painted movingly accurate portraits of the inmates. 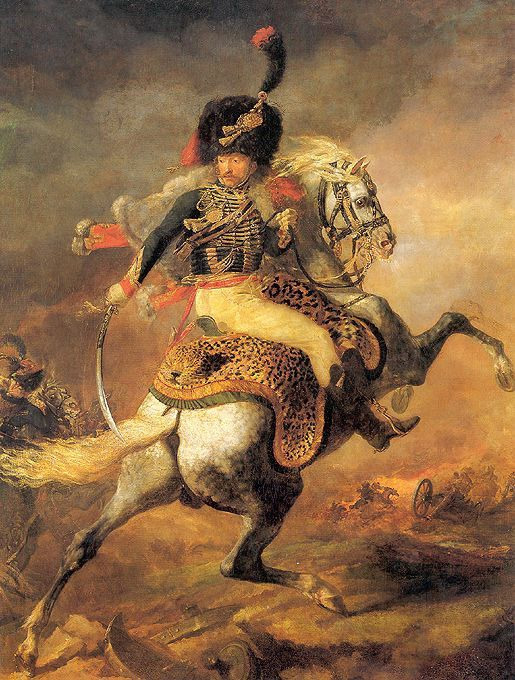 Théodore Géricault died at the young age of 32 from a riding accident and tuberculosis, in the prime of his career. He left a legacy, however, that would influence fellow Romantics as well as artists for centuries to come. 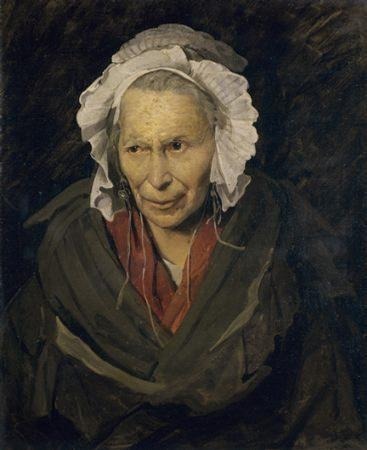 A painting by Géricault is recognizable by its individuality. This was a major tenet of his works, which draws him tightly into the Romantic fold. Through his subject matter, techniques, and stylistic quirks, the young and talented artist painted like no other. Traditionally, up until this time period, artists would sketch a full composition in its entirety onto the canvas, and then paint over this sketch bit by bit. 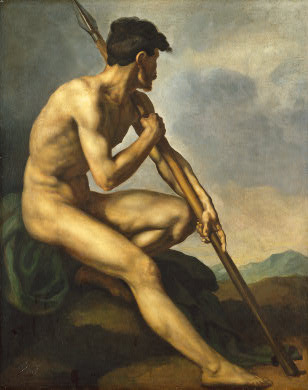 Rather than using this pattern, Géricault focused on an individual part of the composition, such as one figure. He would sketch this portion of the overall composition and then paint it fully before moving onto the next section of the canvas. This gave each body or section of the composition the appearance of being its own miniature composition, lending an unparalleled physicality to each figure. 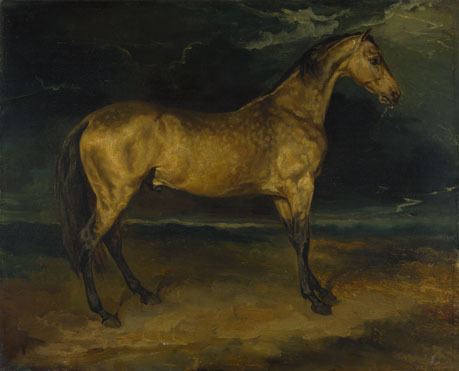 Gericault did not leave behind a large body of work, as he died at such a tragically young age. What he did leave, however, was impressive in its variety and what ties all of his work together is an interest in the present tense, rather than the depiction of historical events or classical themes that characterized Neoclassicism such as horse races, shipwrecks and portraits of the mentally ill.
All of the above clearly break away from the typical subject matter of Classical or Neoclassical artists, bringing the new ideals of Romanticism into play. Rather than making sketches of models and then using the sketches to paint from, the artist used live models when he was painting directly on the canvas. He would often use his own friends, such as the artist Eugéne Delacroix, who had a great deal of patience for maintaining odd poses for lengthy periods of time. 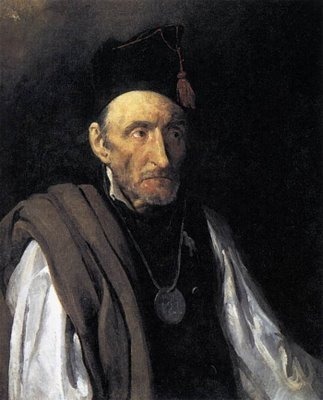 Generally, for his portraits as well as larger compositions, Géricault preferred a warm palette, heavy on the vermillion, ochre, light red, peach, black, and contrasting cream or beige to highlight colored spots. In the interest of focusing on the individual immediacy of painting, Géricault utilized small brushes, applying the paint in precise, fluid strokes that allowed little time or room for correction. The paint was thinly applied, often drying overnight. A product of his time, Géricault heavily absorbed the works of his tutors and immediate predecessors in French art, later twisting them into his own heavily nuanced macabre style. In addition to the Neoclassical artists, one can see the influence of the idea of the Grand Manner in his work, a reliance on classical composition but infused with a dash of individualism in color and emotion. Below are a few of the most directly influential artists on the development of Géricault's unique style. Vernet was Géricault's first teacher, a popular though somewhat mediocre pastoral Neoclassical painter. While he really wished to enter a monastery, he was forced by his father to paint in Paris. 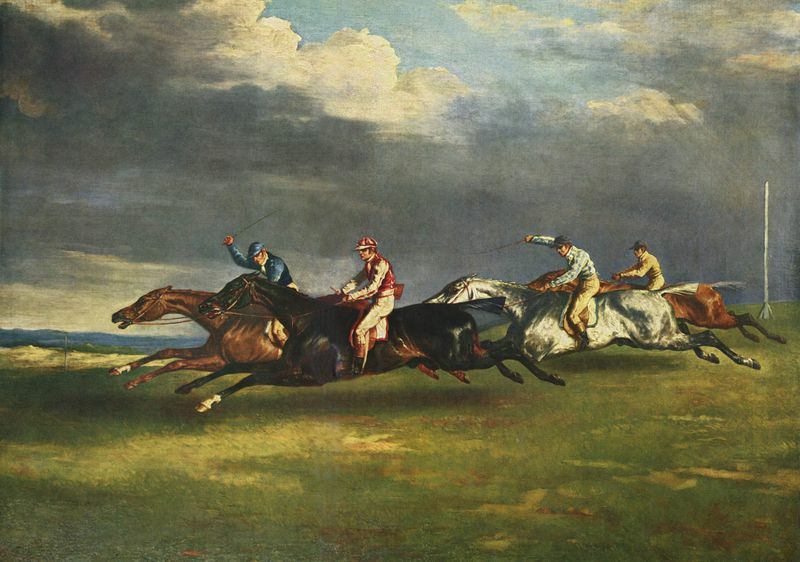 Obsessed with horses and riding scenes, he exerted a basic influence on Géricault's subject matter. 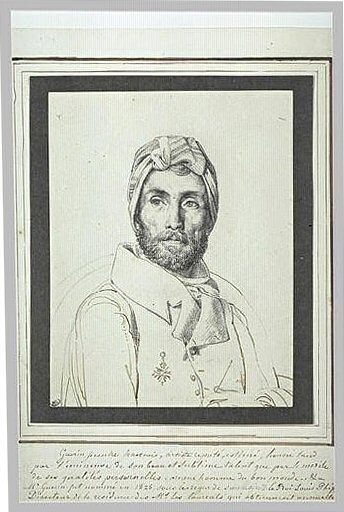 Géricault completed his training, along with Eugene Delacroix, in the house of Guérin, who was another popular Neoclassical painter of the day. He preferred scenes out of mythology or Greek war stories, and his tendency to embrace "real" or violent subject matter had an influence on Géricault's inclinations to depict deep emotions on canvas. In the chaotic scenes of Gros one can see a clear influence on the carefully composed yet emotional works of Géricault. The artist expressed his admiration of Gros quite vocally as an interesting and influential break from the tedium of traditional Neoclassicism. While he painted a wide variety of subjects during his brief yet illustrious career, the viewer can sense that the underlying current that runs through Gericault's work is a true adherence to individualism. This spirit is what his followers admired, from those who knew him directly to those who only felt the electricity radiating from his paintings centuries after his death. Studying together under the guidance of Pierre-Narcisse Guérin, Delacroix and Géricault exerted a profound fellowship and influence over each other. 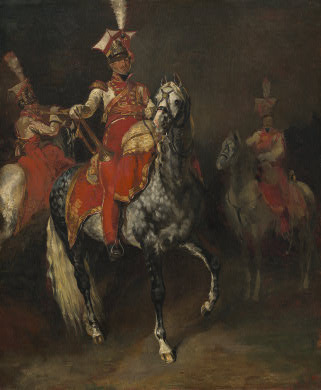 However as Géricault's life was cut tragically short by prolonged illness and several riding accidents, his legacy could only be carried on and built upon by the more anarchic Delacroix. 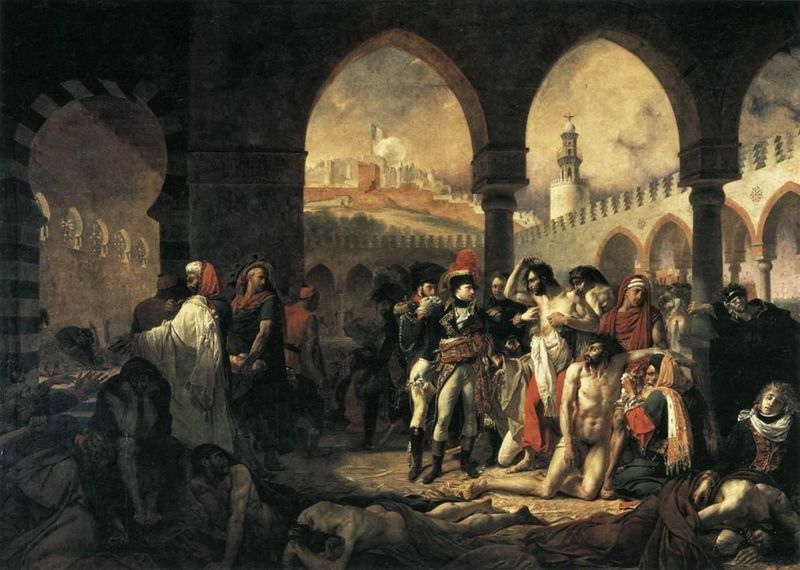 One can see Géricault's bold use of color and raw emotional turmoil in Delacroix's more violent paintings. Together these two artists are known as the figureheads of the French Romantic movement. 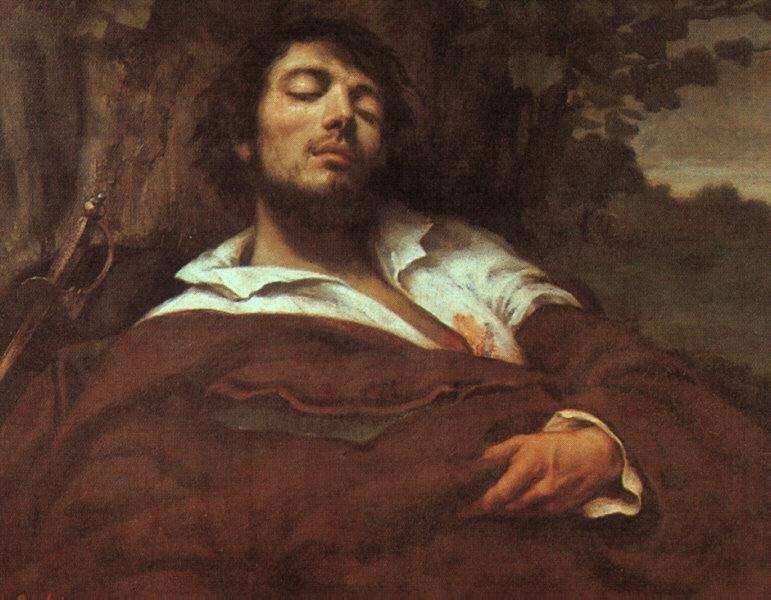 Even more anarchic than either Géricault or Delacroix could ever dare to be was the macho, charming Courbet. He took the influence of Géricault a step further, creating works that verged on shocking in their individualism and realism. Courbet believed that painters should portray life as it appears, and one can see Géricault's series of mental patients in the sharp realism of Courbet. 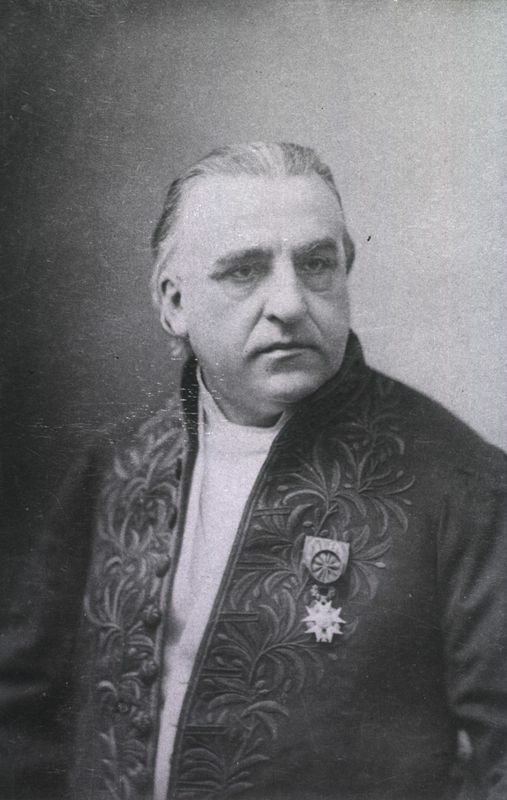 Géricault's last important succession of works, his portraits of the inmates of the asylum were particularly inspirational to a scientist/photographer by the name of Jean-Martin Charcot, who himself worked closely with Sigmund Freud. Charcot was fascinated by Géricault's portraits undertaken about 50 years before, and with the new technology of the camera, he took a series of influential photographs of patients at the same asylum in Paris, Salpetriere. 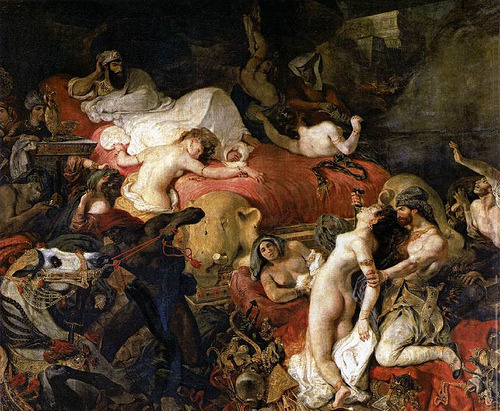 It is impossible to think of the Romantic Movement without thinking of Théodore Géricault. In this day and age, he is well respected, having made a lasting impression on the art world. During his time however, Géricault caused a great deal of controversy amongst critics. He took risks, deviated from the norm, and stayed true to himself. For this, he received both good and bad reviews, though he exerted no shortage of influence over later artists. Géricault's masterpiece, The Raft of the Medusa, was also his most controversial painting. It drew fire from French critics over the political implications and ambiguity of whether the men on the raft were to be rescued or not. Critics thought it too gruesome, too realistic. In fact, Géricault had molded the figures from real life corpses. During the initial showing however, critics had very little to say about the actual artistic merit of the work itself. After its initial exhibition in France with its lukewarm reception, The Raft of the Medusa, and Géricault, received a hero's welcome in England by the art-viewing public and critics alike. 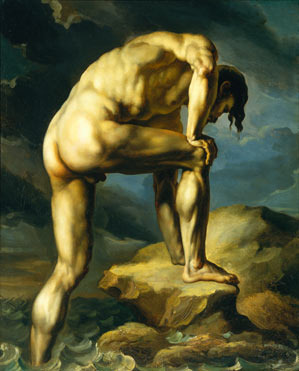 The painting was an immediate success, cementing Gericault's reputation and influence over both Romantic writers and artists. In England, 40,000 people paid a fee to view the painting, as it had received such acclaim. His later works received a similarly welcome reception in London. 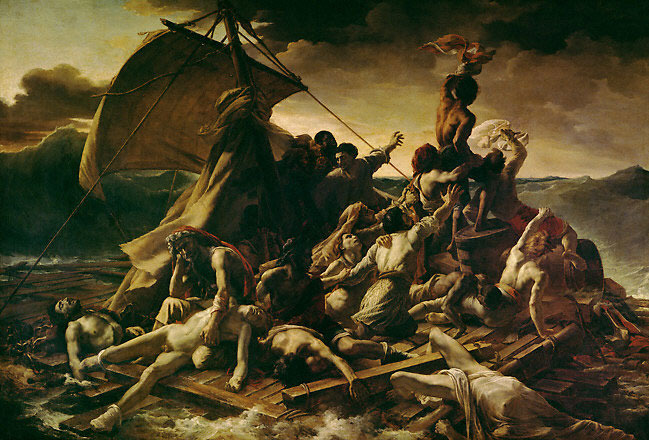 Indeed, critics now view The Raft of the Medusa, along with Géricault's other daring portraits of the mentally ill, as uniquely important in the development of the Romantic style. He went on to influence the Realists, and is now considered a photojournalist even though his work was produced before photography even existed. Géricault's painting style was hugely influential on artists throughout the centuries, earning him a lasting place in the Western canon.